For World Wetlands Day the Irish Peatland Conservation Council (IPCC) are launching the Hop To It Frog Survey 2016. This year there has already been a spike in frog records, most likely due to the strangely mild, wet winter. We have received quite a few records of frog spawn and adult frogs from around the country. The first record we received was from County Meath in early January but we have also received records from counties Wexford, Cork, Dublin and Roscommon. These records are very important as they provide valuable information about the health and range of Ireland’s most common amphibian. The survey has been running since 1997 so by sending us your records throughout the years we can examine any changes in the population size and range over time. 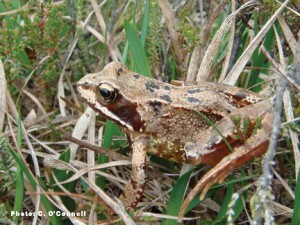 Records can include sightings of frog spawn, tadpoles, froglets and adult frogs. Last year we received 149 new records from around the country, thank you to all who participated and we look forward to receiving more records in 2016. ‘Frogs are indicators of habitat quality because they hold an important place in the food web of wetlands’ says Katie Geraghty, IPCC’s Campaign officer. The IPCC is also celebrating World Wetlands Day at the Bog of Allen Nature Centre. Why not join us and follow our new Museum and Garden Trail and learn the importance of Ireland’s wet peatland habitats. The Bog of Allen Nature Centre is open from 10am- 4pm, there is also the opportunity to do some pond dipping and see first hand the diversity of living creatures in bog pools. You can also visit nearby Lodge Bog a raised bog wetland nature reserve owned by the IPCC.